The Aquatec "R" is designed similar to the Aquatec "F" Fixed back bath lift with the exception that, the backrest reclines as needed. With the ability to recline between 10 and 40 degrees, this model provides the safety, comfort and ease of use synonymous with the Aquatec series. The advantage of battery powered bath lifts is they don't have to be hooked up to the building water supply and can easily be moved from location to location. The disadvantage is, they require regular charging of the battery and occasionally replacement of the battery. 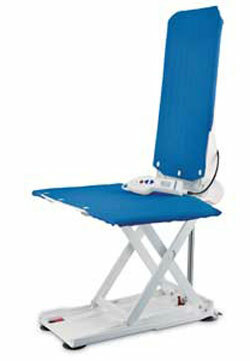 Battery powered bath lifts are constructed to withstand moisture to protect the electrical parts. Because the batteries are relatively low voltage, the chance of electrical shock is highly unlikely or dangerous. The hand control that is used to operate the bath lift will float if dropped into the water while bathing. The maximum seat height the bath lift will elevate to is 17". Because some of today's bath tubs may be deeper than this 17", Aquatec bath lifts have available optional risers to extend the upper limit of elevation to 18", 19" or 20". While these risers allow the bath lift to raise higher, they also prevent the lift from lowering as far into the bath tub an equal amount. Minimum Lift Height 2 1/2", Maximum Lift Height (Optional Risers 2, 4, 6 cm) 17"
Warranty: Three years, excluding cover material and suction cups. Handsets and batteries are covered for two years from the date of purchase.